Are you great with customers? Are you proud of your organizational skills and efficiency? Are you knowledgeable about the real estate and closing process? Do you want to experience something new everyday? If you answered yes to any of these questions, we may have a weekday career position waiting for you at Title First. Title First employs talented individuals throughout a multi-state region. With associates in management, sales, marketing, operations, and information technology, we are a growing, exciting team that values people, collaboration, and customer focus. We offer competitive compensation and an excellent benefits package, including insurance and 401K with company match. Title First is an Equal Opportunity Employer. 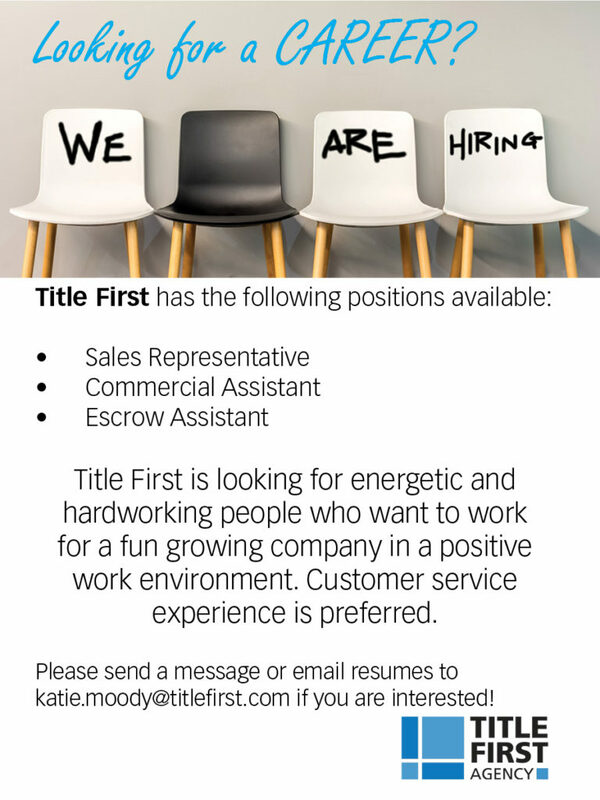 If you are interested in career opportunities with Title First, please submit your resume below. We are currently seeking an Escrow Accounting Associate, Commercial Escrow Processor/Paralegal and Central Ohio Sales/Marketing Representative for central Ohio. Escrow Accounting Associate: must be dependable, possess strong computer and basic book keeping skills and able to run with projects. Upload experience or a willingness to learn, as well as an attention to detail are excellent traits to have in order to excel in this multi-task position in a fast paced office. Two year Associates degree a plus. Commercial Escrow Processor/Paralegal: must be dependable, posses strong computer skills and understanding of real estate concepts and laws, knowledge of title insurance and the closing process a must, multi-state knowledge a plus, attention to details, ability to multi-task and work in a fast paced team environment. Title Insurance license, paralegal certification, or two year associates degree a plus. Central Ohio Sales/Marketing Representative: must be dependable, possess strong interpersonal skills. Ability to communicate effectively with potential clients and general public, ability to assess clients’ needs, investigate and resolve problems. Knowledge of title insurance and the closing process a plus. Attend trade shows, real estate events and organization events and meetings as required.